This year marks the centenary of the outset of World War I and there have already been many events to mark the occasion, including the re-opening of the Imperial War Museum and the unveiling of its excellent First World War galleries. Though that exhibition covered the different perspectives of the countries involved, it understandably had a British focus. 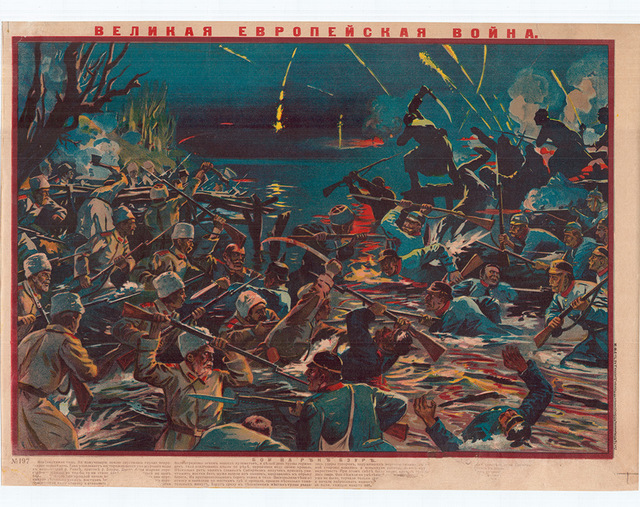 Now GRAD, the Gallery for Russian Arts and Design in Fitzrovia has put on a museum-style exhibition that explores how our Russian allies represented the Great War through a display of propaganda, posters, photographs and news clippings. Some of the most eye-catching imagery is the propaganda, including a handsome Russian soldier laughing at a mockingly stereotyped Turk complete with Fez. 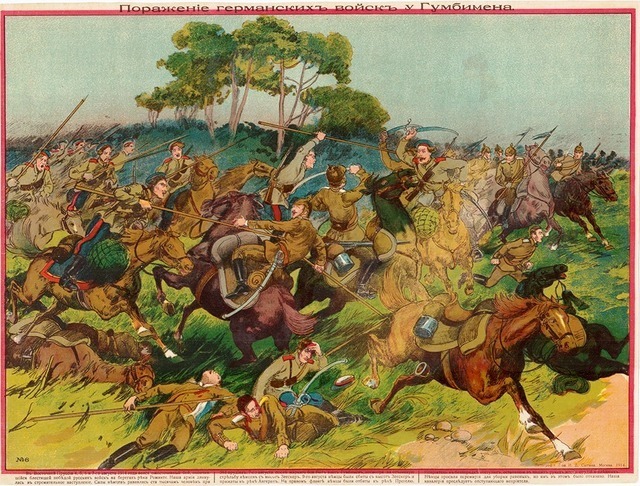 But it's also Russia's allies that are depicted in a good light with Belgians repelling a German assault, the French shooting down a Zeppelin and the British heroically depicted as St. George. 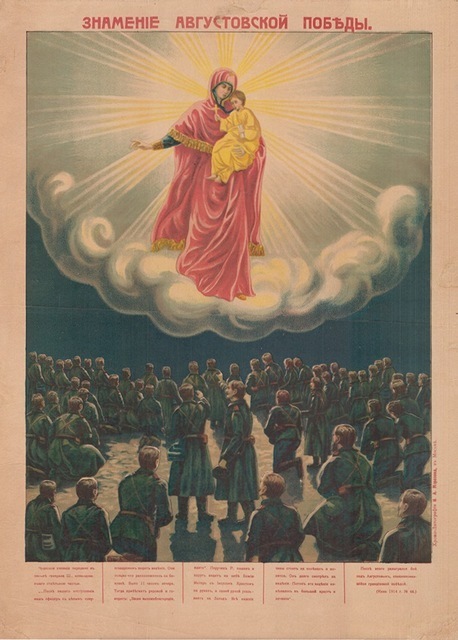 It is said that in Poland in 1914, the Russian troops were inspired by a vision they saw of the Virgin holding the Christ child. This incident is recreated in a poster that owes as much to the altarpieces of Murillo as it does to the art of the time. Our favourite artworks in this show are by Natalia Gonchorova whose futurist angular style captures the intensity of an army marching off to battle as angels watch overhead. 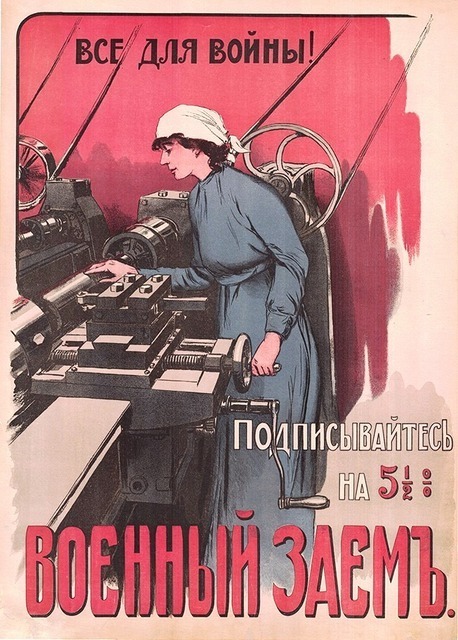 We saw her as the Russian equivalent of CRW Nevinson — one of Britain's greatest war artists. The gallery is packed full of information and fascinating exhibits, and this goes some way towards justifying the entrance fee. 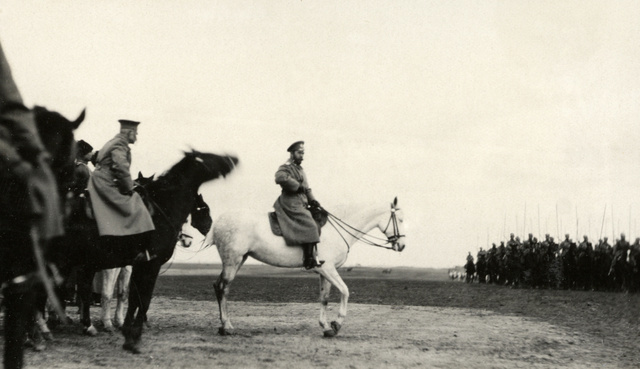 The Russian side of the First World War is something we see very little of in the UK, and this exhibition is an insightful historical record of how they viewed the Great War. 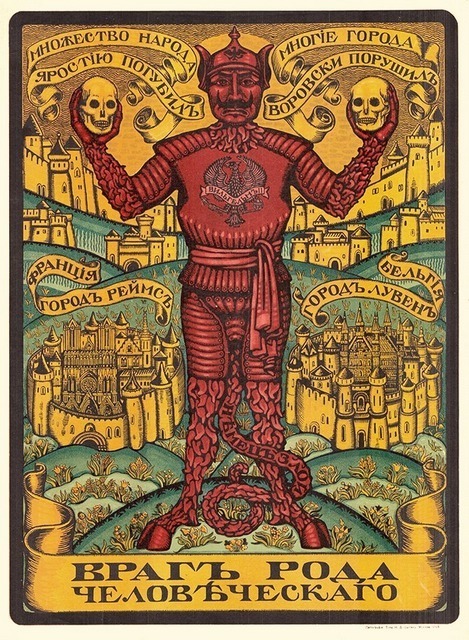 A Game in Hell: The Great War in Russia is on at GRAD: Gallery for Russian Arts and Design, 3-4A Little Portland St, W1W 7JB until 27 November. Entrance is £5, concessions available.